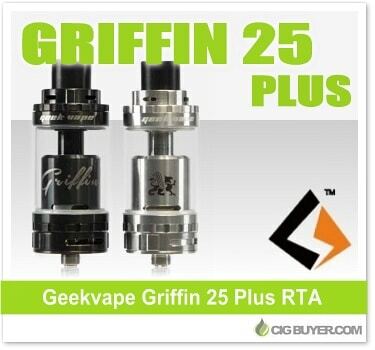 Although it looks exactly the same as the Griffin 25 Tank, the Geekvape Griffin 25 Plus RTA improves upon the popular platform with a redesigned build deck, improved wicking and updated airflow. It has the same threaded top-fill design with 5ml of tank capacity, but the build area has been increased by 10% (18.9mm) with bigger 3mm x 2mm terminals for a wider range of build configurations. The revised wicking system not only simplifies wicking, but a back pressure design provides even faster delivery. And airflow has been improved too, with four raised air holes that direct airflow straight to the coil.